On May 22, a few city blocks from the headquarters of Twitter and Salesforce, a pop-up appeared in a San Francisco park. For two days, the tech industry and other office workers strolling by were offered cookies (real ones, not browser cookies) embedded with chips (white chocolate ones, not microchips). It was the United Airlines Tech Showcase, where the airline's newest industry-leading tech innovations were demonstrated by team members from across the country. "We chose San Francisco to showcase our newest digital offerings, which are as sophisticated as our customers, including those who work in tech," said Janelle Edwards, the sponsorships and brand activation manager for United who headed the operation. "We believe our products will meet or exceed their expectations." She noted that tech-savvy customers are already using apps in airports, for example, and talking to smart speakers like the Amazon Echo. Entering the pop-up tent, visitors encountered a big-screen display of the United app, which will allow smartphone users to book flights, check in with an e-boarding pass, access their United MileagePlus® account information, find out how close they are to attaining Premier® status and even get advice on where to travel. United representatives also explained newly proactive and personalized enhancements to the United website, noting that it will continue to be the best option for finding deals and planning trips, while the app will be the most convenient day-of-travel tool. At the next display, United team members let visitors ask tech devices about United flights, which is also a brand-new feature for the aviation industry. "Alexa, ask United when Flight 816 is arriving from Seattle," they asked the Amazon Echo. "That flight is arriving on time at 4:13 p.m.," she replied. You can also check in for a flight, ask about inflight entertainment and Wi-Fi and request your MileagePlus balance — not only to the Amazon Echo, but also to Google Home devices. The Amazon Echo requires a simple download of the "skill" to link to a MileagePlus member's account. Google Home links to member accounts through Google Assistant. The team also demonstrated use of the new United App on the Fitbit® Ionic Smartwatch. All of these tools are free. "Visitors today were excited to see how this worked," said Jeff Ulrich, senior manager of eCommerce digital innovation for United. "People are really embracing the use of voice rather than typing, and we aim to introduce other features, too, such as offering travel suggestions." The United Tech App that rolled out this year — the first mobile tech log to be adopted by any airline — will never be seen by customers. However, the customers will see benefits in the form of fewer and shorter flight delays and an extra layer of safety. Mansur Zia, lead technician at the San Francisco International Terminal, explained that until now, any service checks or repairs required printing paper manuals that had to be brought out to the plane. 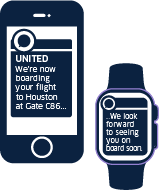 The new app, accessible on iPads that all United technicians will be using by July 1, receives real-time information from aircraft monitoring systems and crew-generated log items are instantly transmitted to technicians. All manuals are on the iPads, with step-by-step repair instructions. Once all checks and repairs are made, the app's lights turn from red to green and the plane can take off. "For last-minute repairs, we found that issues are rectified in seven to nine fewer minutes, which significantly improves on-time performance," Zia noted. Pop-up visitors had the most fun on the couches where virtual reality headsets led them on a six-minute virtual tour of the luxurious United Polaris® lounges and United Polaris inflight experience. They were virtually transported first to the lounges, equipped with dining choices inspired by the destinations United serves, quiet suites and shower suites containing Soho House & Co's Cowshed spa products. Next, they took in the 360-degree, 3D filming of customers traveling in United Polaris, with seats that recline flat to six feet, six inches, among other amenities. United Polaris seating is available on all long-haul international flights with Boeing 777-300 planes and being added to 777-200s and 757s. United Polaris lounges have been completed at Chicago O'Hare, New York/Newark and San Francisco, with additional lounges opening at Houston Intercontinental this summer and Los Angeles this fall. A free trip — and cookies! One lucky pop-up visitor won a drawing for roundtrip tickets on United Polaris business class. As for the rest, they enjoyed the same Christie Cookie Co.® White Chocolate Cranberry handcrafted cookies that United Polaris customers are given now as a pre-arrival amenity. As United team members learned in San Francisco, no one can resist a cookie, not even techies.